Preheat the oven to 425 degrees F. Preheat a large skillet over medium high heat. Brown ground beef and drain the fat. 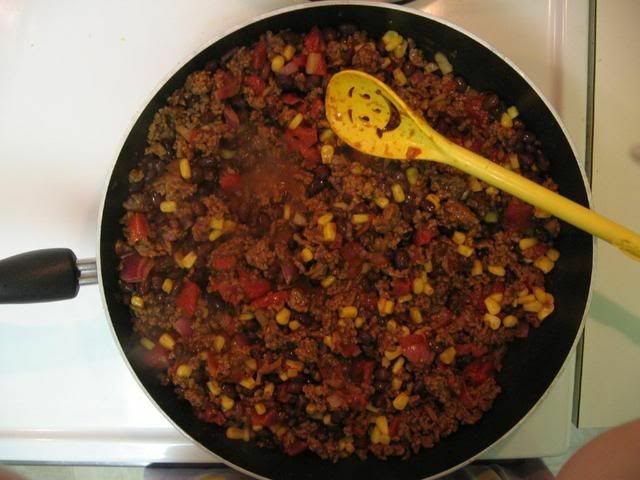 Return beef to pan and add taco seasoning (and water, if the seasoning packet calls for such) chili powder, cumin, and red onion. Mix and cook for 2-3 minutes. Add fire roasted tomatoes, black beans, and corn. Heat the mixture through, 2 to 3 minutes, then season with salt to your taste. Spray a shallow baking dish (disposable oven-proof baking dishes are wonderful for freezing in) with nonstick spray. Cut the tortillas in half or quarters to make them easy to layer with. Build lasagna in layers of meat and beans, then tortillas, then cheese. Repeat: meat, tortilla, cheese again. If freezing, wrap tightly and freeze, keeping bag of scallions and side of salsa in the fridge ready to serve on the side. 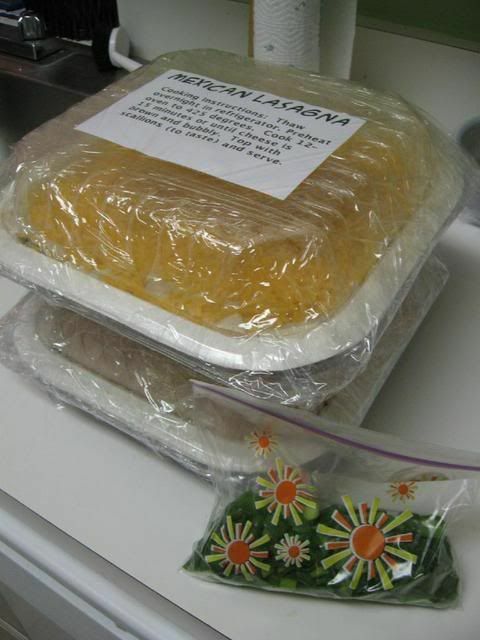 Lasagna will keep for up to 3 months. If not freezing, simply bake lasagna 12 to 15 minutes until cheese is brown and bubbly. Top with the scallions and serve. NOTE: if you’re freezing the lasagna but don’t have a disposable baking dish, you can also line a glass baking dish with foil and leave the ends hanging over the dish. Assemble your lasagna in the dish and bake only about 10 minutes. Then, after it’s cooled, you can freeze the casserole, pull it out using the ends of the foil, and store it in a large ziplock bag. When you’re ready to thaw and bake, you can use the original dish. Thawing Instructions: Thaw overnight in refrigerator. Preheat oven to 425 degrees. Cook 30 minutes or until casserole is heated through and cheese is brown and bubbly. Top with scallions (to taste) and serve. Mexican Lasagna filling: browned ground beef, red onions, taco seasoning, extra chili powder and cumin, corn, black beans, and fire-roasted tomatoes. 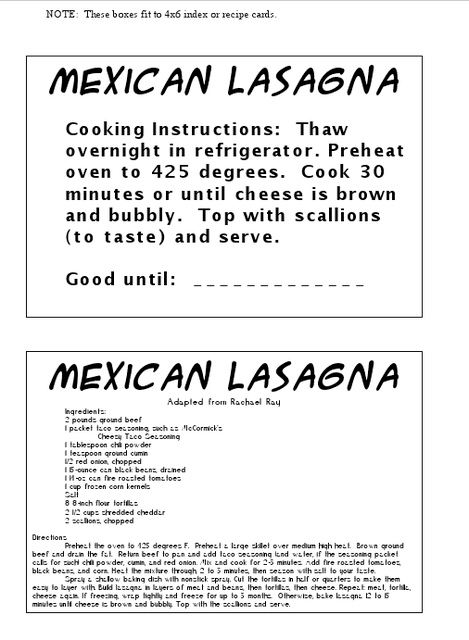 Click here to download thawing/baking instruction labels and recipe card to include with this dish. I found your blog through Bakebakebake on Livejournal – your posting about this recipe. I’m planning on trying it out soon, but HAD to share that I have that same Koolaid spoon! HAHA! That’s awesome! I was actually hoping someone out there might recognize my beloved spoon! I mean, I use this thing ALL THE TIME. I got it with a package of Splenda once, for free! This looks delicious, I’m planning on making it tomorrow. Do you know if this would work better in a 9×13 pan or 11×17?!? Hope you love it!! We adore this recipe. I bake it in a 9 x 13 pan. Let me know what you think! I had leftovers for lunch today…yum! Can I substitute wraps for tortillas? I think that will work fine, Teresa! Making this to freeze and share. Could you clarify? The above recipe makes 1 meal to bake in a 9×13 pan? Pic looks like two smaller pans. Do you think a layer of refried beans would work instead of the can of black beans? Happen to have them handy, but never cooked with them before. Trudy, I baked in two smaller pans to help with stacking in the freezer (or so they could reheat half at a time for smaller meals). You can feel free to do it either way 🙂 I do think the refried beans would work! Hope you love it! Wondering how well the tortillas keep when stored/frozen in sauce. Do they get soggy by the time you defrost and bake? I love the taste of corn tortillas. Can I replace the flour with corn? If so, will they freeze well or turn to mush? Sure, Deanna! Go for it! I think they will freeze well.